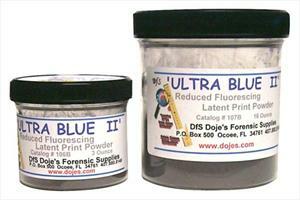 Produced from DfS Ultra Blue 2000 Latent Powder. This formulation is used for processing of latent prints on surfaces where reduced powder adherence is necessary. Note: This distinctive powder was formulated through research conducted to provide more visualization of friction ridge detail. Ultra Blue II may be used visually or excited with a light source.